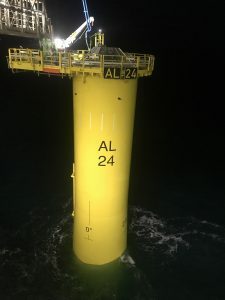 A2Sea’s jack-up vessel Sea Installer has installed the last transition piece on the EnBW Hohe See and Albatros offshore wind projects in Germany. Courtesy of DEME Group’s Paul Watson. The two projects have a combined capacity of 609MW comprising 87 Siemens Gamesa 7MW turbines installed on monopile foundations some 95km north of Borkum island. Swire Blue Ocean’s jack-up Pacific Osprey started installing foundations at the projects in April last year. In mid-February, EnBW announced that Sea Installer and DEME Offshore’s Innovation will join the construction of the wind farms. Fred. Olsen Windcarrier’s jack-up Brave Tern recently installed the first turbine at the Hohe See offshore wind farm. The 497MW Hohe See and the 112MW Albatros are expected to be commissioned by the end of the year.